It started! Some Mini E drivers are waiting for it, this is the second electric car from the BMW group, the ActiveE. This EV is based on the 1-series, we note that it’s entirely BMW-engineered. Not like the Mini E which used an electric motor sourced from AC Propulsion. About 1100 ActiveE will be built, but none will be sold. A lease will be the only way to get one, that’s how 30 people get theirs in Berlin. The operation has been very carefully planned, with Vatenfall and Siemens as partners to provide chargers, electricity and the backbone which will link everything together. This giant test is the last of its kind for BMW, which will begin building the i3, a regular production model, after the ActiveE. 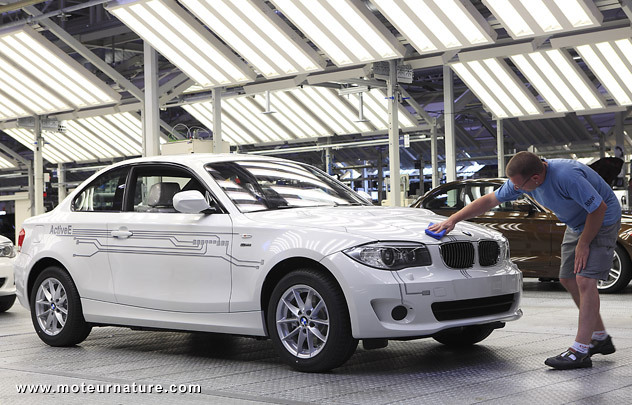 The idea is that this test will help BMW to make its production electric car better, and give it a more thorough understanding of drivers behaviors and expectations. The BMW ActiveE will arrive in the UK and the US next year.